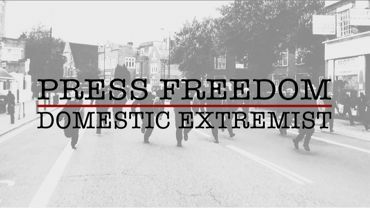 A TWO-MINUTE trailer is now out for Press Freedom: Domestic Extremist , the third in a trilogy of documentaries by NUJ videographers and photographers on the problematic policing that journalists can encounter in the course of their work. Domestic Extremist looks in particular at the discovery by six NUJ members that police from the National Public Order Intelligence Unit (NPIOU) had systematically been gathering intelligence on reporters who cover protest and environmental issues. The trailer is here, for some background see here. The full-length movie is expected to be released relatively soon, ("no deadline yet,", filmmaker Jason N. Parkinson told the Freelance in early September,) watch this space. The documentary was part-funded with a modest donation voted by London Freelance Branch, for which Jason says "a massive thanks to the Freelance Branch".